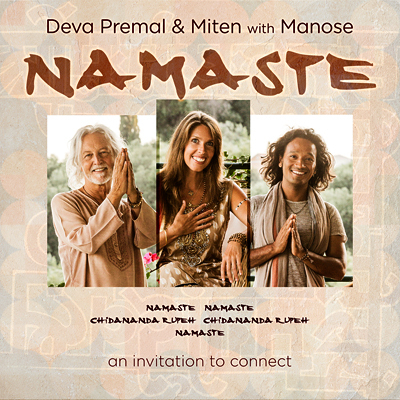 Deva & Miten with Manose have recorded the Namaste Mantra, which has become a much loved favourite at their worldwide concerts and holiday retreats. You can listen to the new recording here in our player. It is also available at iTunes, Amazon and Spotify. Part of the proceeds from this track will be donated to the Gayatri Fund, supporting villages in Nepal. “We so love sharing this mantra with you all, and as we have travelled from country to country, we have seen the ‘namaste ritual’ take wings and become one of the highlights of our evenings. Greeting a stranger with ‘namaste’, making eye contact, palms joined, chanting the mantra, is such a powerful experience of affirmation and connection. In Buddhist terms, we are ‘greeting the Buddha within’.